James Adams, David Armour, Jonathan Bell, Maria Blazquez, Jamie Brogan-Shaw, Mike Buffham, Rob Campling, Cindy Cao, Victor Carmon, KK Chan, Nick Chase, Nigel Cheetham, Scott Clark, Nigel Clift, Dominic Cobley, Peter Coyle, Jon Cronk, Di Dai, Kurt Dennis, David Doyle, Andrew Edwards, Phil Elwell, John Ferdinand, Doug Freegard, Ian Furlong, Shawn Guo, Philip Harrison, Jason Hicks, Stefan Ho, Andrew Hoare, Gordon Hollingworth, Tuomas Hollman, EikPei Hu, James Hughes, Andy Hulbert, Anand Jain, David John, Prasanna Kerekoppa, Shaik Labeeb, Trevor Latham, Steve Le, David Lee, David Lewsey, Sherman Li, Xizhe Li, Simon Long, Fu Luo Larson, Juan Martinez, Sandhya Menon, Ben Mercer, James Mills, Max Passell, Mark Perry, Eric Phiri, Ashwin Rao, Justin Rees, James Reilly, Matt Rowley, Akshaye Sama, Ian Saturley, Serge Schneider, Manuel Sedlmair, Shawn Shadburn, Veeresh Shivashimper, Graham Smith, Ben Stephens, Mike Stimson, Yuree Tchong, Stuart Thomson, John Wadsworth, Ian Watch, Sarah Williams, Jason Zhu. Wow. Oh Hap-Pi Day! Onwards & Upwards Raspberry Pi. Nice surprise waking up this morning =oD Hope to quickly get my hands on one here in France. Bravo. Just to clarify a point you made in your video about 5GHz wi-fi – 802.11ac is NOT required for 5GHz support. My old laptop, which doesn’t even support 802.11n (only a, b and g) will happily talk to my new broadband router in the 5GHz band using 802.11g. You can also do 802.11n on the 5GHz band. It talks 802.11a at 5 GHz not 802.11g. Congratulations from the pi-top team, we are excited about the new features! Happy Pi Day!!! I want one… no I need one! Really waiting for them to add some eMMC storage like the Tinket Board, that would make the Pi the best value out there. That would increase the price too much for only a tiny benefit for the vast majority of Pi customers. Yep, really need a version that includes storage this is the only reason im not buying any more pi’s until they do(i have 3 P1, P2, P2+). I looked into this but doesn’t odder much speed advantage over and SSD but I’ll grant you they’re more compact. Short answer…get a CM3 or a NEC “CM3-16”. Great work guys. Thank you for this. I would have liked 2GB, but at this price point the Raspberry Pi is unbeatable! Not possible with this iteration of the SoC. 1GB is the limit. See Eben’s posts above. Is the black dot on the heat spreader a hole or is it just printed on it? If it is a hole you probably can’t cover it with a heatsink, can you? i read that u cant cover it with a heatsink bc they changed the cpu size. but i don’t know if it’s still necessary to cover it with an heatsink. Heatsinks will work fine, but the new thermal management means they are less necessary for most tasks. Got mine today, it’s definitely a hole. Can’t easily tell if what I see through it is die or encapsulant. I’m assuming it’s there to either allow for thermal expansion, or simply for filling underneath the heatspreader with encapsulant. I just happened to be up late and trolling on twitter when I saw the news. I hit up Pimoroni and ordered 2 of them before they could run out. One for Amibian and one for my Libreelec box. I wonder how much difference this will make on playing x265 video. Thanks for the update! Will the new firmware for the BCM2837B0 become also available as a Jessie upgrade? I’d like to replace my Pi2 systems with the 3B+, but for a number of reasons they still have to use Jessie. The firmware should work with Jessie. I’m not sure we’ll be doing an “official” update though. Great work! I’m going to order one as soon as I finished writing this comment! Also I like the news about a 3A+, I suppose it will be able to act like an ethernet gadget like the Pi Zero? Will it also have Wifi/Bluetooth? It’s not a well-defined product yet, but the assumption is that it would have some sort of wireless, and a single USB port that could be made to work in gadget mode (small issue about the OTG ID pin, but probably resolvable). Is it passive or active PoE? Also, are you implementing PoE with a floating ground? I assume not given somebody is bound to attach the Pi to something with ground tied to Earth. is there a simple reset button on the POE 802.3 Af Hat? and did you manage to find a wiring route path for the FM antenna ? A somewhat related question; The ‘reduced schematics’ do not, as far as I can tell, include the PoE header and connections. Is that a mishap or a deliberate omission? How muuch will the PoE HAT cost?! Looks like a really nice set of improvements. Well done! Would have been great, but the volumes weren’t there, so it would have been a paper launch. But, but, but……It’s Pi Day! Great news – thank you, what a wonderful achievement. The storage shouldn’t matter for computer classes at all. That is EXACTLY the kind of scenario that network booting is beautiful for. The RAM really can’t be helped until they switch from videocore 4 to 5 because a single gigabyte is the maximum VC4 can address. And no you shouldn’t get your hopes up too far because there have been no official announcements that a switch is even in a roadmap anywhere. It is just a somewhat assumed thing that it will happen at some point when the silicon is ready at a price point that is right for the foundation. In the meantime you can really accomplish an amazing amount of tasks with “only” 1 gig of RAM when you take out a lot of the bloat so many modern systems use just to make things pretty instead of adding functionality. There are a lot of use that still have childlike wonder and a certain giddiness seeing how much hardware they keep throwing at us for 35 dollars. It isn’t all that long ago when you couldn’t even find a computer with a 64 bit CPU let alone a multicore one and even in the early 2000’s a gig of RAM on a desktop was a pretty big deal. Go back a decade before that and I know from experience that a 33MHz 486 with 8MB of RAM and a 330 MB hard drive, a video card with 2 MB of RAM, a soundcard with 16 bit audio, a 2X CD-ROM (a big deal at the time), and a 17 inch CRT cost around 2,500 dollars. It was also the same approximate size and weight as a 5 or 6 year old child. I mean really stop and think about it. This is a whole computer small enough to fit in a drive bay of a desktop. To use a modern web browser, you need about 1.5 GB of RAM to view sites without video. An extra 512MB or RAM would make the Pi suitable for everyday use as a computer (if you’re using a USB hard drive). I agree. Insane to require 1.5GB just to display a website. You need the Stretch release from 2018-03-13 for the B3+. Previous releases do not work (result in 8 flashes after the rainbow screen). Great work and good improvements! Keep it up and I guess we will see Raspberry Pi 4 by next year? Great evolutionary change ! Love the etched metal bits as well. Faster networking (I presume) make this a good candidate for making WiFi hotspot / router projects. Nice one ! It’s a nice balanced design for wireless/wired bridge products now. I’m using one as a hotspot and wireless NAS, for which the USB 2.0 storage bandwidth is perfectly adequate. This is a nice upgrade! Just wondering though… Since the gigabit ethernet is over USB 2.0, I’m assuming there is still only one USB bus right? So if I connect a USB hard drive and try streaming from the Pi over a wired network, it will cut the throughput in half, right? Not sure about half, but yes, the USB bandwidth is shared. I love you guys. thank you for you are. Very Good news. Does it support Windows 10 IOT Core as previous version of Raspberry pi 3? Microsoft are working to add B+ support to IoT Core at the moment. Amazing! Enjoy the Pi day with a new RPi. Thank you all for made what the Maker word means. Still throttled by the USB2 bus though. Now if it had USB3, ethernet could be 1000Mb/s and SSD would work at a realistic speed and make a superb desktop machine. I know, it defeats the original objective of a simple machine for schools and the like. If you want such a machine, the Odroid XU4 at 60$ does all of that. The eagle has landed. Well done guys! Thanks Bruce. Appreciate the help. So, you use this Broadcom chip to power Raspberry Pi, but is there anywhere datasheet containing the electrical properties of the chip? You should not connect *any* peripheral to any of the pins without knowing the load these pins could sustain. And such information, which would otherwise be a part of the electrical specifications in the datasheet, doesn’t seem to be public. Would you honour the warranty request if an user puts a 500mA load on a pin that can only sustain 50mA and fries the whole thing? The published datasheet contains the data you seem to think is missing. Could you please link to the data sheet? There’s also http://www.scribd.com/doc/101830961 if you want even more details. Are the reset jumpers in place and soldered in? I found it very difficult soldering those pins. No, we have not fitted pins to the reset and power-enable holes. as I understand from this post, the Bluetooth chip has been replaced, am I right? That’s correct. CYW43438 has been replaced with CYW43455. Looking forward to getting this in India at the earliest. Does this use a 5.1v or 5v power supply? Hi Gordon, we can’t all use the official PSU in our industrial applications. My applications use a DIN rail mounted PSU rated at 5V 2A. I cannot use a plug-in PSU for compliance and engineering reasons. The general specification that we assume on 5V regulated rails is +/-5% and we expect all connected equipement to be able to accept this. TTL logic chips are similarly rated. It would be helpful if you could provide an official tolerance for the 5V supply to the Pi 3B+. Many thanks. So a very stable 4.75V supply is preferable to a poorly regulated 5.2V. The official power supply is “special” because it has a slightly boosted zero-load voltage, good regulation under varying load, and thick wire (I kid you not) to minimise cable losses. Thanks, Eben. You have provided the information that I need in our application and I am sure others will be pleased to see this. Perhaps it could be put on your site somewhere in the specs for the Pi. I totally agree with your statements regarding the upper and lower values, but we aim for high (5.1 V) as the only cable we can get with a micro-USB plug fitted is rather thin! We keep it very short ;) I know what you mean about the thickness of the cable on the official PSU and wish we could get a better cable. I don’t suppose you could offer one? I think 2GB of RAM at $35 will need to wait a while: RAM prices are incredibly high at the moment, and remain on an upward trajectory. Or are there other hardware limits as well? Like the power consumption? There are limitations to the SoC architecture which cap us at 1GB. These are in theory fixable, but we’ve not prioritised that while RAM remains so expensive. …in exchange for providing substantially more computing power to the user. When you run a chip faster, it uses more power – that’s something of a physical law, and not really our fault! And note the Pi Zero is still available, which using the much less hungry bcm2835 processor, so you have an option the save the world right there. Is there a way to lower the power consumption by programmatically setting a (substantially) lower core frequency? That would be green! It also needs to be taken in context. Probably talking ~1W more max at the wall than before ? My graphics card idles in my PC (budget GPU) at not much less than a fully loaded Pi stretch to the full and uses substantially more (6/7times) when in use. According to this it’s about 1W more idle and 2W more under load: https://www.raspberrypi.org/magpi/wp-content/uploads/2018/03/Raspberry-Pi-Benchmarks-Power-Draw.jpg which is a significant increase. But yes the added speed is nice too. This is a point release, so a gradual improvement over the previous model. Putting in something like HEVC HW would require a new SoC. However, you can do software decode of HEVC, not sure of the maximum resolution possible though. We can play much of the 1080p HEVC content that’s out in the wild at the moment (including 10-bit). Our “software” implementation has a generous dose of GPU-acceleration magic, and we’ve invested heavily in NEON optimisation. IS there any good howto to follow in order to get H.265 playback running? What I need to do? What is the supporting player ( VLC? ) etc. Please guide me! Will it be possible to easily solder an u.FL connector to have an external WLAN/Bluetooth antenna? I’m sure someone will find a way, but this isn’t something we could officially support, as it has serious effects on RF compliance. After looking at the bottom picture from Farnell’s site I can tell you the point people were using before to mount U.FL connectors is gone. Will be interesting to see if someone comes up with an alternative. Ok did a bit of digging. The FCC docs show the on board antenna and if you ask me it looks like at U.FL could be mounted there. https://apps.fcc.gov/eas/GetApplicationAttachment.html?id=3777866 last page of the document. While I’m sure the RF compliance exercise would be a challenge it is high on our want list here at a University. We have challenging RF spaces and a mandated “single service” wireless infrastructure and the on-PCB antenna just doesn’t cut it. Being able to connect external antenna(e) would make the RPi much more enticing to many researchers and build clubs here. It simply isn’t going to happen. It’s a compliance nightmare, and would require us to supply a known tested antenna with every model. So expensive as well. The problem isn’t the Pi, it’s your environment. I’m sure it would be easy to find some very cheap antenna to provide as tested antenna… even if not a good one due to price, hardly it would be worst (and avoid internal interferences) than a pcb mounted antenna… and would give user the chance to replace it to a better one, if user wants! Please re-think on this for the future… Thanks. Even a cheap antenna increases the cost of the Pi for everyone, even if the huge majority don’t need one. And the FCC compliance things really is a nightmare. I really cannot see it happening at least for the next few models. Simplicity and common sense appear to be your ‘super powers’. Fighting the urge of “I must have one… my precious”, expect to succumb soon. Will be able the new model to play UDH/4K videos (using e.g. Libreelec/Kodi)? This is still a 1080p-class device. We can however play a lot of the 1080p HEVC content that’s out there. I can’t wait to get one! Sadly, here in South Africa we have to wait for ICASA approval before they can be imported (legally). It took them 7 weeks to approve the Pi Zero W.
Just to be clear: the 300Mb/s Ethernet is only going to work with 1Gb/s switches and cable, right? It will work with switches UPTO that speed. So should be entirely backwards compatible, but will obviously run at the speed of the slowest switch. Well it *is* a physical gigabit ethernet interface after all. It’s a bit coy calling it 330MBit just because it’s restricted by USB2. I guess that’s just to head off the trolls. And we are still waiting for approval. Superb work Eben and co! If I’ve got an up-to-date Jesse Lite SD card from a Pi3 B, will it work straight away if swapped into a B+? Ton van Overbeek’s comment suggests it would if new enough. I’d got my image installed before the date he gave, but have updated it with apt-get as per here, so am guessing it would be fine, although confirmation would be much appreciated. As Simon has said elsewhere in the comments, we’d expect you to be able to rpi-update a Jessie image with current B+-compatible firmware. Taking a backup first might be advisable. How high is the heat spreader of the cpu in comparison to the metal shield of the wireless circuity? Can i place a wide cooler on top of the cpu without interfering with the metal shield? I’m using my Pi3 inside a case from WDLabs (the flat one) together with a 2TB usb hdd. The temperatures inside the case (hdd + RasPi) forced me to add a massive cooling solution and i had to add a copper plate to the CPU in order do get the actual cooler high enough above the circuit board to avoid any contact to the components on the board. cooling is still passive as the cooler is cut to fit in between 40pin header and all the other higher parts on the board. 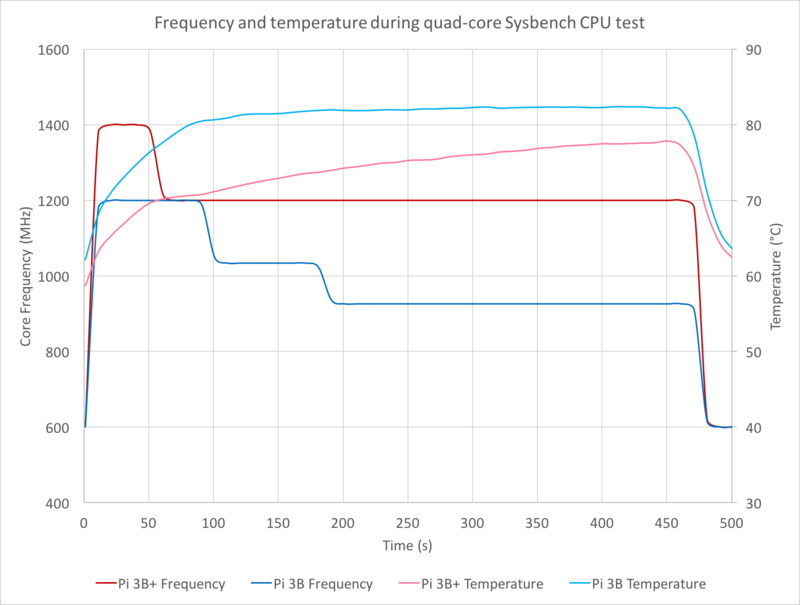 Thermal management is a LOT more efficient on the 3B+, using the PCB to move heat away from the processor as well as the cap. You *might* get away with no heatsink, but you will need to try it in your particular enclosure. I appreciate your answer, but i doubt that i will get away without. While the look of my WDLabs case is pretty nice, the thermal conditions are far from optimal. Air is trapped inside the case and a hdd and raspi under full load in summer heat up pretty quick. Only after applying a cooler taken from an old passive cooled graphics card i got rid of chronic overheating (at least of my RasPi, never checked hdd temp). So my question remains: Is the cpu heat spreader higher than the wireless metal shield? Quick look, they appear to be the same height. 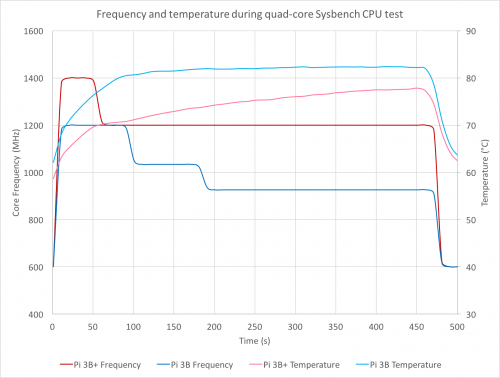 Note that the PCB itself is now acting as a heatsink, and pumping heat down the wired connectors, so the thermal dissipation capability is much higher than the 3B. This thermal design appears to work very well. A short power-on time (enough to do a quick goods-in check) and the USB sockets and ethernet socket shrouds are all warm to the touch. As are the GPIO pins. I guess they’re all acting as little radiators (convectors). Perhaps we won’t need a heatsink now in a standard case? Thanks for the attention to detail! Looking at the hi-res photo clickable above, those vias look weird. Where’s the drill hole gone? …and along similar lines, what are the weird solder-blobs between the LAN7515 and the Ethernet socket? Those sites would be for EMC/ESD diode packs. They give the ethernet PHI device added protection for any extreme pick-up on very long ethernet cables, or installations in noisy environments. I’m not familiar with the ethernet IC used here, but they were probably dropped for cost reasons. I’m more intrigued by the 45degree placement of these and the 1(!) capacitor on this board. We have all the components to build our first 20k in hand, so we’re literally just waiting for a manufacturing slot. Late April if we’re lucky, early to mid May more likely. I have read the limitations of faster preformance and less power from the processor is the 40nm node size which is very old. Why can’t they go to a smaller process? Moving to a new process is a painful and time consuming job, with no guarantee it will work without major changes to the silicon. So not a trivial task. Eben has stated that we have pretty much reached the limit of the current process. 35 dollar?? Not here in the Netherlands. The cheapest I can find it is 49 dollar including shipping. Not worth it. Try some of the UK suppliers who will ship to the Netherlands, probably cheaper. It’s $35 plus local taxes and shipping, which of course vary quite a bit according to the locality; that said, the $49 total you mention is within pennies of the cost of a 3B+, shipped, in the UK. I think I’ll wait till they are sold through AlieExpress. Buying there and having it shipped from China to the Netherlands is usually ( a lot) cheaper then having it send to me from the local warehouse down the street, so to speak. Cheaper because you are avoiding paying the tax you should be paying. There should be import duty applied, and whatever the Dutch equivalent of VAT is. Buying from Aliexpress is avoiding that, so you are in effect giving money to China (the profit) instead of your home country (profit and tax). I was really hoping for a 2GB model… I honestly would have preferred more RAM over a faster network port and even a faster CPU… Bluetooth? Who is even using Bluetooth with these boards anyway? In any case, I’ll hold out until they have a new model with more RAM, and the same power demands as the original Pi 3 or Pi 2. Well, more RAM would require a new SoC, so rather out of the remit of this gradual upgrade. People do use Bluetooth, you know the Pi3 has BT, don’t you, so that capability hasn’t changed. As for power demands – if you want a faster processor, or more RAM, or faster networking, then the power requirements go up. You cannot change the laws of physics. So please don’t expect any future models to use less power. We are not Scotty. RAM is incredibly expensive right now. And be thankful that these aren’t good for crypto-mining. Sorry a bit late with this comment. But I happily use bluetooth. My PI sits behind the TV and it’s running retro-pi+kodi, I control it using a PS3 bluetooth controller and it all works wonderfully. So I was happy to have the onboard bluetooth support. On previous PI models I was using a bluetooth dongle and setting it up was much more painful (same with having the onboard wifi, made things much easier). -Tens of thousands of people all around the world, who are using Retropie/Recalbox on Raspberry Pi, with their bluetooth game controllers/joysticks? Congrats on the new Pi 3+. I’m looking forward to using one in the future especially with the new 5Ghz Wi-Fi capabilities. Though i am wondering if there has been a solution to the issue of the Pi being unable to connected to an enterprise network i.e. one that requires account and password as i would love to use it in university but unfortunately cannot connect to the Wi-Fi. Pi’s can be connected to Eduroam WiFi(WPA2 peap with mschapv2) with username and password with a correct config. wpa-supplicant which Raspbian uses has no problems whatsoever connecting to a WPA2 Enterprise network, but you may have to configure it manually. What is improved about USB mass-storage booting? OOh! Does that mean I might finally be able to ditch the sd boot card and USB boot successfully directly from my WD Pi-Drive more often than the 1 in 20 times I get now? I’ve just successfully booted a fresh-out-of-the-box Pi 3B+ from a microSD card in a USB card-reader plugged into one of the Pi’s USB ports (with nothing in the Pi’s microSD card slot) :-) Very cool. What I need to test is to see what effect the new release of Raspbian has when setting up a CM3L in a WD SATA Adapter. That I’ve had problems with. So how much more power does it need, in which situation, and can the power usage be reduced if not a lot of CPU power is needed all the time? There isn’t a datasheet of the processor, with a lot of features undocumented, like for example, DPI ports. There isn’t even complete schematics of the board available. I don’t understand why: nobody could copy your product, as you don’t sell the processor to anyone. *Anyone* can buy the SoCs….so long as they are willing (and able) to commit to buying enough of them. Congratulations! Another great pi server for my pi zeros to connect to! You’ve gone and done it again…thanks Raspberry_Pi, you’ve made my π Day :) In context these are significant upgrades, but doing so without increase in price and not even trying to capitalise on what could have been marketed as Pi4 is a touch of class. Well done everyone! Bit out there but is there scope to build in the capacity for a wireless casting of a virtual desktop? Perhaps to a chromecast-esque dongle? Best of both worlds with a headless setup which still allows use of a graphical interface, and of course v portable. Casting is pretty much a SW issue. I sure some people have got Miracast working. Thanks, I’ll investigate Miracast. Ideally, what I would like ascertain if it’s possible to mirror the Pi desktop or video output to another device over WiFi? I appreciate that it is a software issue to a point, however is it not possible that if a receiver HDMI/USB dongle could receive the broadcasted visual, with a universal design to enable portability and out-of-the-box connectivity? Does VNC not do what you want? That can work over any sort of network connection. Adding that connector would mean we have to supply an antenna otherwise we would not be able to get any sort of FCC compliance and would not be able to sell the product at all. Too expensive, a cost that would be passed on to huge numbers of people who simply don’t need the feature. So, yes, we know exactly what we are doing. Adding that connector would be a terrible idea. The new Raspberry Pi 3 Model B+, except of all other things, has one, really very, very, important on my opinion – the Power ENable Input. That means you can switch the Raspberry Pi ON/OFF, directly from your added PCB (i.e. in our case from PIco) without removing micro USB cable or adding an external switch to it. That make the Raspberry Pi 3 Model B+, a perfect device for embedded applications. Now, you can fit-in your hardware to the case and switch your application ON/OFF easy, and professionally. Raspberry Pi Engineers, You are PERFECT designers !! Hmmm, looking at the reduced schematics it appears to be a Power ENable output? Looks like a simple voltage-divider means that it outputs 3.2V when the board is powered with 5V? But the possible switch off button through new POE will shutdown Pi correctly or just cut energy? Can you tell us a little more about this? Do you just need to pull the PEN to ground to “cut the power”? This would be great. I can think of a few ways of using this. Something similar to the pi-supply or an ATTiny that reads a switch and a GPIO to determine when to cut power. Does work when powering via the GPIO, or just when powering via USB. Why it still does not support decoder Format: H.264,H.265 ??? 4K in the 21st century …. Full HW decode of H265 etc would require a new SoC and this is a point release rather than a entirely new Pi. However, the ARM cores are now capable of fairly decent decode in software. Meanwhile, H264 still works and is a pretty decent format. Could you clarify this? I assume this won’t work with omxplayer since it relies on hardware support (which the Pi doesn’t have for h265). Is there another way to play h265 media over HDMI on a *headless* Pi3? Yes, we are spending considerable time and money on optimising the H265 codec using HW blocks where we can, and NEON as much as possible. This means that the majority of HEVC stuff out there will work fine up to 1080p. Including 10bit. The work is still ongoing, but the latest overnight millhouse builds of Kodi have this codec in. Does it support windows 10 iot core ? Not yet, but Microsoft are working on it. Care to comment about the unfair competitive advantage you’ve given some retailers such as Pimoroni? Become a approved reseller, get early access to new product. Simples. Does the GPU share in the speed boost? I don’t see any figures for its clock speed? We’ve not increased the GPU clock at launch. We do have lots of margin though, so may do so (from 400/300 to 500/400) in due course. thanks for that, I would love to see a bit of a speed boost on the GPU but appreciate it will increase power and heat. Can I also ask Eben, I know its a done deal now, but was there ever a possibility of increasing the number of cores for the GPU? I realise graphic programming is not high on most users list but it is on mine and I’d love to see Raspberry systems compete with some of the multi core GPU systems? it is a welcome point release, thank you. i was looking for any improvement in the GPU if that will support faster rendering of the camera frames. I doubt there will be any improvements to the camera system for some time. What particularly is your issue? there is certainly no issue, it is just in my wish list to stream from my camera a resolution more than the current limited 1080p due to H264 encoder limitation. This is an excellent and well considered evolutionary step in the RasPi series. I think your temperature and frequency plot is labeled backwards. Is it possible to underclock it, in situations where all the horsepower is not necessary, but there still is a requirement for eg. WiFi? Does this sale spread across the world? Or only in the US? Also does this sale include the VAT or not? The dealer here says that the product is not on sale in Europe and it is sold at its normal price. At this moment RS here in Denmark claims to have approx 4.500 in stock, and Farnell around 8.000! Not quite sure what you mean by sale. This is the latest Pi model, and is $35 plus local taxes/P&P. And will stay at that price. Should be available worldwide, we have made a LOT up front so supply should be good. I think there’s confusion between “on sale” meaning “available for purchase”, and “on sale” meaning “being sold at a reduced price”. In this article, it’s referring to the first meaning. 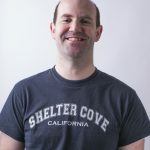 I ‘knew’ that there had to be ‘something’ in your release pipeline – and I didn’t believe that PiTowers could be shut down by ‘the wrong kind of snow’ (as Ebene recently suggested. So, a nice surprise to wake up to this morning, and simply the best excuse I can think of for giving my Credit Card a gentle workout. What a coincidence that this is also Albert Einstein’s 139th birthday and, sadly, the date of Stephen Hawking’s death. I think he would have found a certain amusement in this. Is that a Pickard reference from TNG? The “four pins” caption? Yes it is! I was just about to ask whether I was supposed to hear Patrick Stewart’s voice in my head while reading that caption. I’m just sorry I did not wait for “PI Day” and bought 14 days ago Raspberry Pi 3 B (without plus). Gigabit Ethernet refers to a standard for data transmission with regards to signalling, electrical characteristics, and some other low-level stuff. The port and the Ethernet hardware are Gigabit Ethernet, just like most modern computers are, however the USB bus that the NIC sits on is not actually capable of dealing with 1Gbps of data bandwidth. That’s why they made it clear that it was capped at 330Mbps. This is similar to a lot of consumer routers that were on sale in recent years. They were in the “gigabit routing class”, but the WAN port could sometimes only sustain 300-700 Mpbs speeds. It was a hardware limitation based on what the processor and hardware in the router could actually handle, as opposed to a limitation of the network hardware itself. A nice update. But still with only a gigabyte of RAM, Pi is not very useful for general computing, no matter how much CPU grunt you add to it. I understand that you are trying to stick to 35$ price tag, but I would be more than happy to pay extra money for a more substantial hardware upgrade than this. Pi is still way behind the competition in the hardware department. Let’s hope that the next-gen Pi will be more capable. If your applications need more than 1GB, you probably need to write better software. There are some exceptions. Not many. Lots of people use the Pi for general computing, so your premise seems to be wrong, and this one is even better. As for way behind the competition, well, not sure that is true either. Note that moving to >1GB requires a new SOC, therefor a COMPLETE redesign of the Pi. Very expensive, very time consuming, and not something that would be expected at this point in the roadmap. This is not 1981. It’s 2018 – and you’re, please, trying to talk 1GB is enough for -almost- anyone? I consider this as a joke. I respect and agree your -technical?- reasons. However, there are tons of people who are willing to pay more *for extra*. I wish, you’d at least offer a more-paid-plus-plus hardware for people who are waiting for a >1GB Raspberry Pi. I dunno, I could go with it. I have 3 Raspberry Pi’s, and not a single one of them is suffering from memory related performance problems. I mean, yes, I can’t take a 1G RAM Raspberry Pi and make a great ZFS server out of it, but the 1G RAM is only part of the problem, the lack of high speed external I/O is also a big deal there. You don’t get to solve all the world’s computing needs at the $35 price point. For $35 the thing is fantastic. More over 1G of RAM is more then enough for thousands and thousands of tasks. Bumping to 2G or 4G doesn’t really open up whole new worlds of possibilities. It just slightly nudges a window open. Don’t get me wrong, I’m a lazy programmer, if you want to give me 4G of RAM I’ll be happy to take it. I just don’t see it as world shaking. In fact for the primary mission of the Pi (providing an entry point into CS and Entering for England’s school aged kids) 1G of RAM is far more the sufficient. After all that was done in the 1980’s on RAM measured in K bytes. The world has moved on, but not by so much that that same mission can’t be accomplished with a gigabyte. I mean it was only 2012 when 256M was sufficient for this task. Six years hasn’t moved that bar very much, 1G has lots of headroom for people just learning what Python and Scratch can do. For people learning how to wire LEDs to GPIO pins and get real world experience with hardware modification. I totally believe that _you_ would be willing to pay more for more RAM, or that I would pay more for more RAM and SATA (& I bet more RAM will come some year, but SATA is far far less likely). I don’t think any of that is needed to make the Pi a better educational platform, and _all_ of that would require design and test time, would add SKUs to manage, and increase support burdens. Already available from multiple resellers worldwide – you don’t need to wait for Amazon. Congratulations on the delivery of your new Pi. Why no hardware gigabit MAC? Lots of CPU cycles going down the drain for USB -> gigabit. I don’t believe there’s a significant additional CPU load associated with running Ethernet over USB. Of course an onboard MAC would give us a full gigabit of bandwidth, but it would also necessitate some more radical surgery to the SoC. Great stuff. Figures though, I just bought 20 RPi 3B for my school 2 weeks ago! Had no idea a new model was in the works. I’ll have to pick myself one of these today. Sorry – we never announce stuff like this in advance I am afraid. Interesting to see PoE make an appearance. I’m assuming the four-pin header is just for the four PoE lines from the Ethernet jack and that the 5V output is fed to the board through a different connector? I do hope you’ll be encapsulating the transformer to stop fingers touching the 48V DC and higher switching voltages on the transformer pins. As always, the PoE will adhere to all appropriate standards. One of the reasons we don’t churn out model after model like some competitors is that we actually bother to go through testing procedures and make sure that products are fit for purpose. Oh I’m sure you do James, I have no doubt ;) I remember years ago designing a PoE product and getting tingles and shocks off the flyback transformer. A perspex plate and a warning sticker kept my fingers from getting zapped. 50v and lower is regarded as safe, which is why POE ethernet cabling can be run without an electrical permit/license. Sure you might feel a little tingle if you touch it, but it is by no means deadly. This is why POE standards set the voltage to around the 48v mark. It is the most efficient in regards to voltage drop over a long cable run way to get power from the injector/switch to the powered device without the end user involving an electrician and permits. The behaviour of the flyback circuit could put considerably more than 48V at one of the transformer terminals. Use of a snubber to limit the primary-side ringing would help with emissions. Also we made sure it will all fit inside the Raspberry Pi official case so you can protect your fingers! POE comes from the telecomms world, which has standardised on -48V DC for a variety of reasons (48V = 4 x 12V battery banks, high enough to get good signal-to-noise, low enough not to shock linesmen up poles, positive ground to minimise corrosion in underground cables, etc). I’m currently running a couple of Pi3B’s 24/7 for general desktop/media stuff behind our two TVs (kitchen and lounge). Both booting from MSD SSDs. Great, love them, thanks. One question: When I set them up ~12 months ago I had to burn a one-time-programmable bit in the CPU – is it now set or do I need to repeat this stage. No: now we’re more confident in the MSD and PXE boot modes, these bits are blown by default. Nice job, but why still only 1GB RAM? RAM is going through one of its periodic price spikes. It wasn’t feasible to add more to the design while sticking to the $35 price point. Don’t worry though: we’re well aware of the appetite for more RAM, and will come back to this once prices moderate. Even server RAMs are 5-10 % up so… Trend is set more like this up to 2019-20 I assume. I do hope not. There was some sign of moderation early this year, but as you say it’s started to increase again. WOW. You give people improvements, keep it the same price and still get complaints! These are nicely added features. I would suggest if they don’t meet your needs, buy a competitors product. While not an engineer I understand the issues of adding more RAM, USB 3.0 and dedicated Ethernet. etc. Those items cost $ and the manufacturing line process would have to be changed. I currently have a Pi3B that I have setup as a wireless router. (among other projects). I can’ wait to switch my micro card in the new model, update the OS and see the results. I live in SE Pennsylvania. Lucky enough to have a store, MicroCenter, that sells the PI line of pc and other add ons. Its actually on my way to/from work so I order online and pickup in store. No shipping required. Plus they sell the Pi3B for $29.95 and currently sell the Pi0W for an incredible $3.14. They charge more for 2 or more. Don’t understand the reasoning there. I simply place another order the next day and pick it up for the same price. These are great features. Thanks for them and for the support the Pi community has in general. Plus being a programmer/analyst, DBA, etc I’m learning python coding and enjoying it. Awesome to see the FCC module compliance, thanks guys! Running apt-get update/upgrade on a pre 2018-03-13 Stretch image will make the SD-card boot on the 3B+. Of course you have to update it on another Pi. And the boot to desktop (stretch-full) is clearly faster than on the 3B. We would like to become distributors/ resellers for the Florida region. Can you direct me to your distributor sign up program? Please email [email protected] for details of our approved reseller program. Is the TF/SD card controller any faster? I would know this too. There are also issues with hitting the USB hard and the SDCARD at the same time. We’ve not increased the speed of the SD interface. Would be interested in hearing more about the issues you’ve been having with SD and USB together. Great news! The main question is how much will it cost? I’m guessing $35 plus tax and shipping. Any photos of the underside of the board? POE – IOT, here we come!! Super excited about this…we should start to see many more monitoring devices now a sensibly priced POE is an option……..
this is the one we’ve been waiting for! Old it is, though I prefer “beautifully simple” to “ugly”. Can the new and improved power circuitry give us a low power standby ? Yes. The unpopulated PEN (power enable) header allows you to take down the PMIC. There’s probably scope to create a HAT with a microcontroller that puts the whole Pi into an ultra-low-power state. More on this in a future post. Enclosures have not been mentioned. Please tell us about compatibility of the new Pi with existing / older enclosures. It fits the official Raspberry Pi Case for the Model 3. It will probably fit most third party cases, as the board is the same size and connectors are in the same places, but we can’t make any guarantees – for example, it doesn’t fit the PiBow case; I believe the PoE connector is positioned where a part of the case goes. I’ll get excited when I can get my hands on one at the MSRP of $35 in 9 months to a year. 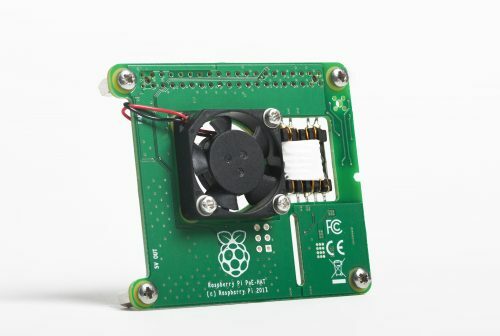 I really wish the PI foundation would rein in their re-sellers for the 1st few months after a release and limit sales to one per customer and outright BAN the practice of bundling them in $100 “starter packs”. These “starter packs” are just full of crap the seasoned PI user does not need. If a re-seller wanted to make the starter pack contents minus the PI a separate line item that gets a discount with purchase of a PI, I would be fine with that. One would think that after this many product launches, they would have a clue what the demand is for these products and have a reasonable number of them available on launch date that they don’t all sell out within an hour or less. But why are they still limited after 2 years? I understood it at first when demand outstripped supply, but 2 years is more than enough to have ramped up supply if you wanted to. At this point it seems like zero sales are being deliberately suppressed in order to sell the more profitable models. If that’s the case why did you even create the zero in the first place? I would buy dozens of zeros at retail if they were available. We have multiple 100k’s in the supply chain – there should be plenty. Our back office also check to make sure that resellers are not trying to make a quick buck. The Pi main models are sold in a different way to the Zero range, you might be getting the two confused. Yeah I do understand that it is not $35 inclusive of taxes shipping. I’ve generally paid between the $40-$45 mark for previous PIs in the past. It is just quite annoying when all of the stand alone PIs are gone and all that re-sellers have left in stock are PIs that are part of some $100 starter pack. I really wish the practice of bundling PIs in the starter packs would stop. Just sell the PIs stand alone, if the re-sellers what to sell a separate starter pack sans the PI for $100 and knock $25 or something off the price of the starter pack if ordered in the same order as a PI i would be fine with that. Er, what? 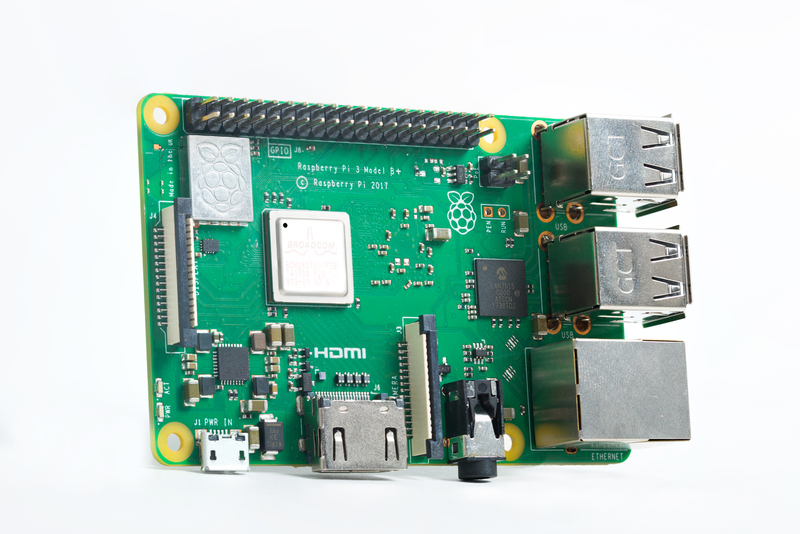 There were over 200k Pi3B+ in the supply chain, most being sold individually. I doubt many have made it in to bundles yet. There seem to be plenty individual Pi3b+ available, so would be interesting to know whereabouts in the world you are that you seem unable to get one. Note, that the supply chain in USA was only filled yesterday due to FCC requirements, so will take a day or two to hit the shops. The only Pi I have ever bought was part of a bundle….and everyone who sells bundles also sells individually. Are you sure you are not confusing Pi3B+ with the Pi0, which does tend to be sold in bundles. I ordered a Pi3B+ on Tuesday afternoon for $35 plus tax (about $3) and shipping–$6 (USPS) and got it Thursday. Where are you ordering from that won’t do that? Congratulations to all involved in bringing this out!!! Looking forward to getting one into my hands. My cat and I are anxiously awaiting our backordered RasPi3B+. Our goal is to implement a Google Assistant function: Hey Google, where’s the cat? As it is a new chip (BCM2837B0) I am wondering if the issues with the I2C functionality are fixed regarding repeated start and clock stretching functionality? Hello, that´s are great news. At what time come the Raspbian 64bit version for Pi 3B/3B+? That was promised at Pi 3B release date, 2 years ago. Hmmm…perhaps no explicit ‘promise’, but when Raspbian is the official distro and then the subsequent adoption of a 64-bit processor, I would argue you have indeed made an implicit ‘promise’ or at minimum, signalled certain intentions. Why have Raspbian as the official distro, toss in a 64-bit chip, then say: ‘well, OpenSUSE was really clammering for it…but, please use 32-bit Raspbian & don’t expect 64-bit Raspbian…that was because of OpenSUSEs endless yammerimg; again though, don’t even think about using OpenSUSE or any other 64-bit communist distro..’? What’s the point? Until the PI has more than 4GB of RAM there is ABSOLUTELY NO need for 64bit OS. 64Bit isn’t faster because OMG 64bits. The only reason the PI likely has a 64bit SOC is because it is all they could obtain at the price point they were looking for. Any 32bit only SOCs on the market are probably NOS sitting in a warehouse somewhere. The price is probably inflated since they are out of production and the assumption being anyone who wanted it would be using it for an extreme niche case. The use of an out production SOC in the PI would quickly deplete the remaining stock and they would then be stuck with releasing yet another revision for whatever different 32bit SOC they could find, or just say screw it and go to a 64bit SOC that is currently in production. This is probably also why the early revision Pi2 has a 32bit SOC, but the newer revision Pi2 has essentially the same 64bit SOC that the Pi3 has. Supply ran out of the 32bit SOCs, they are out of production so move to the current in production SOCs which are all 64bit. Exactly. There is very little value in adopting a 64-bit OS unless you actually need to access memory above the 32-bit threshold, and we don’t fit that much memory to the Pi! 64-bit OSes tend to be larger installs than the equivalent 32-bit versions (see Windows 32-bit vs. 64-bit for details – the 64-bit versions of Windows take up around 30% more hard drive space than the equivalent 32-bit versions), and SD card capacity (and download bandwidth) is still relatively pricey, so we try to keep the images as small as possible. We are able to access all of the Pi’s RAM with a 32-bit OS – until such time as we need 64-bit access, a 64-bit OS is really not a priority, and we are certainly making no promises (“implicit” or otherwise) as to when we might provide one. So ASUS, Odroid, LeMaker, etc. ad nauseum, all had a heck of a time getting 32-bit processors for the endless run of SBCs on the market…? You notice how it’s generally harder to find out you’re looking at a 32-bit SBC than a 64-bit? Everyone who has a 64-bit chip, it’s front and center – if not part of the name of the SBC itself… The Raspberry Pi 3B is just as guilty as the rest – if you’re ringing the 64-bit dinner bell, by the time I get to my plate, I’m expecting some 64-bit meat on my plate lest the plate is smashed onto the wall. “‘Implicitly'” indeed; implicitly, there has been a promise of Raspbian 64-bit. Look at it like this: why did OpenSUSE get a 64-bit OS ready for the Pi – perhaps there are situations where a single Pi has no need for 64-bit due to limited RAM, but more than one Pi has been sold, maybe people own more than one, and maybe they utilize them in a context that requires 64-bit. Since Raspbian should be the de facto OS, adapted to the hardware best, when I need a 64-bit OS, I don’t go to OpenSUSEs website first – usually the company that produced the device is the 1st stop. I’m perfectly fine using other distros, but unless you can say 100% of the time, there will never be a need for a 64-bit OS on the RPi3B, then you’ve also said ‘if you need a 64-bit OS, don’t purchase our board.’ So this line of reasoning is not to the Pi’s benefit – if it is such a horrendous idea, can we assume there will then absolutely never be a 64-bit version of Raspbian that will operate on the RPi3? So, then either implicit or explicit never; right now, it is explicitly never ever – we just scored a deal on 64-bit chips, advertised the point everywhere, but just a deal nonetheless…..
No, there hasn’t. There has been no “promise” of any such thing anywhere other than in your own fertile imagination. We are keeping an eye on the requirement for and availability of a 64-bit OS, but as yet, there is no compelling common use case which requires it. However, there *is* a compelling use case for not providing a 64-bit OS – it won’t run at all on Pi 1 or Pi Zero. The Raspbian image we ship works on all models of the Pi – this is by design, and is something we see as being hugely desirable. If we were to release a 64-bit image, we would have to do so alongside a 32-bit image. We then start to fragment the software platform; we have to build, test and support multiple images; we double the workload for every software release we make, and we have to field the inevitable support requests from beginners who have tried to run the 64-bit image on their Pi Zero and don’t understand why it doesn’t boot. At present, we do not see sufficient upside from a 64-bit OS to justify the pain. 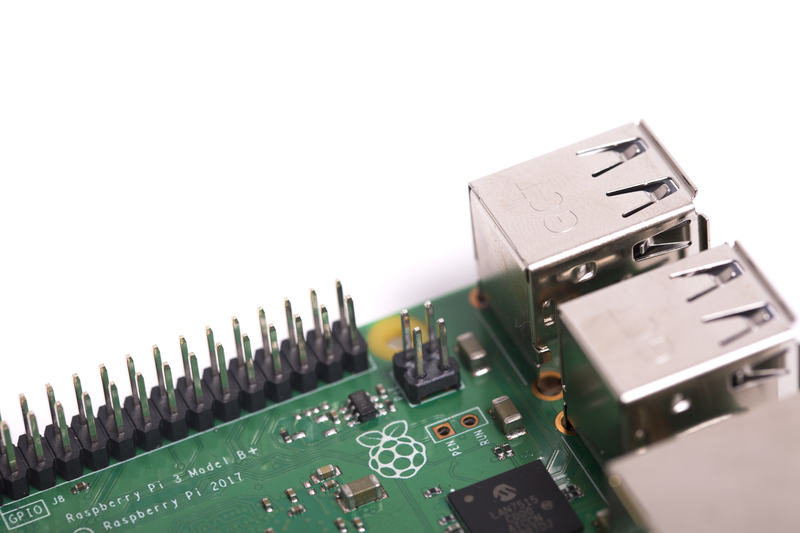 Wait…the RPi is a learning platform for beginners…and THEY would be a ‘pain’?! Certainly, I can decontextualize arguments as well – you’ve quite the spin, I’ll admit that. And you do have tact even when pushed – something that at least one angry individual answering questions on here does not. Anyway, I can push implicit promise all day long; you just want ‘promise’ gone altogether – I will concede; I’m not out to spoil your day, nor knock down the Raspberry Pi 3B(+). Truth be told, I’ve never even used Raspbian, even on my very first RPi I purchased. I went straight for Kali Linux because I heard you could put it on the Pi3B and I used Backtrack quite a bit back in the day. So I really have no ground to stand on speaking with regard to Raspbian. But this is consumerism and I think direct challenges to those creating & selling a product benefit both the organization and the consumer – so I take the comment on my imagination as a compliment & I say Thank You! Congratulations to the engineering team and everyone else at the Raspberry Pi Foundation! It is fantastic that a product in this price range reflects ideals of standardisation, compatibility and reliability that are usually seen only in high-end systems. There are a number of people who express concern that Raspbian uses a 32-bit kernel and userland whereas other distributions for the Pi provide 64-bit options. As far as I know, not only is Raspbian 32 bit, but the userland further targets ARMv6 processors. One losses 64-bit integers when moving from 64-bit ARMv8 code to 32-bit ARMv7. One further losses NEON short vectors when moving from ARMv7 to ARMv6. From a performance point of view, either loss could be more than four fold or almost nothing depending on the application. Having a well maintained operating system called Raspbian that runs without change on all models is important and one of the distinguishing features of the Raspberry Pi. Thank you for preserving my investment in time and money by keeping things compatible. Sometimes yes, sometimes no. On some CPUs you need to be in 64bit mode in order to use all 64 data bits in the integer register file. Building 1024b or larger multiples out of 32b*32b -> 64b multiply is definitely faster then 16b*16b -> 32b. That is a big win even with a “limited” 1G address space. Likewise one population count on a 64b register is faster then 2 population counts on 32b registers plus an add. On the x86 you also get more registers in 64bit mode, but I don’t believe that is applicable on the ARM, nor is it register starved like x86-32 anyway. On other ARM systems the calling conventions were changed when going from 32bit to 64bit, generally for the better. If I recall ObjC’s send message got something like 7% faster. This may be relevant to the Pi, if the calling conventions chosen for the original Pi were derived from generations of calling conventions all backwards compatible with pre-Pi hardware (and this is very possible because they used existing compilers and existing Linux ports!). That is a pretty small bump though, and it might not offset the additional memory pressure of addresses being twice as large (and integers as well if the common short=32b, int=64b, long=64b pattern is chosen). Both pressure on overall system RAM and on cache usage. So more nuanced then “ABSOLUTELY NO”, but for most uses it is firmly in the “no big deal” area…and sometimes in the “definitely worse” zone. Can I make a request that the power ceiling for future rPi be 2.4a instead of 2.5a? All of my current adapters and cables are tested for 5v 2.4a. I’m sure a 2.4a power adapter will be fine 99% of situations, but a vast majority of 5v USB-A power adapters don’t go above 2.4a for USB2 connections. My guess is the next Pi will go with a USB-C port if the power req keeps climbing. I’m kinda surprised they didn’t do that with this one. Problem then is that everyone has to go out and buy a new power supply… Plus USB C isn’t all that cheap at the moment, three or four times the cost for the connector in the 1m off quantity! You mention 64 bit chip, will there be a better 64 bit support? Memory mapped IO operations, mongodb, several bits of apache software, postgresql, all benefit from larger address sizes. More so in the case of mongodb considering that on a pi, each node can only store 4gig total in the database. And its not just about that, the extra processor registers, ability to use simd directly, rather then as a co-processor, and removal of the odd ball conditional instructions(aka simplified decode path) Give armv8 a good boost. When you say these pieces of software “benefit”, is that actually demonstrable in benchmarks? If so, what is the degree of benefit they see? By what percentage do they speed up? This is what no-one has managed to provide – actual evidence of the benefits of 64-bit. If people can demonstrate a real improvement in performance in useful applications that are used by a significant proportion of the user base, we are happy to consider moving to 64-bit; but thus far, we’ve not seen any evidence that it is actually worthwhile. You do know there are ways to build your own 64 bit kernel with Jessie, right? In my situation, it’s not about performance but I’m using 64 bits software (only) for consumer market, we are probably switch to a competitor because of it. A 3B+, delivered, costs the equivalent of ~$48.50 in the UK too; the price is $35 plus local taxes and shipping, and of course those vary a lot according to where you are in the world, what kind of consumer you are, and so on. For me it was slightly cheaper to buy 3B+ and 0W at pimoroni with shipping to CZ than it would be to buy same stuff via rpishop cz with local shipping. And as a bonus with pimoroni I can get another Pi Zero with each order :-) rpishop won’t sell me another cheap Zero (ever? ), they previously cancelled my second Zero order few weeks after first one claiming I already have one and can’t get another! So I don’t buy with them anymore. Fortunately at Pimoroni Zero is one per order, not per customer, so that is where my Pi 3B+ money went today (and as already said it was even cheaper). You mention 64 bit twice in the article. Will there be a support improvement ? For example more kernel support or a 64 bits raspbian. Congrats on the “mid-life kicker”. The Pi3B+ looks to be a quite nice upgrade. Also…excited that there is at least a possibility of a Pi3A+, though I have to admit that the feeling is tempered by a long–by Pi standards–string of disappointing failures to make good on “promises” in this area, what with the cancellation of the Pi2A and non-appearance of the Pi3A. First, the Pi3A+. The A+ is getting pretty long in the tooth and needs a refresh. Right now, there is comparatively little to distinguish an A+ from a Pi0 (even though there are sound technical differences). A Pi3A+ would, I think, provide a solid “middle choice” where a B series Pi isn’t needed or wanted and a ‘2835 based board just won’t cut it. Second, another refresh of the Pi2B. Call it a Pi2B+ for want of anything better. It would reduce the number of BoM items to stock as all ‘2837 parts would be the B0 stepping. It could probably allow boosting the default clock of the Pi2B to 1GHz or 1.1GHz. Switching to the LAN9515 would give the same boost to Ethernet speed (and, I dare say, that would be done without changing from Pi2B to Pi2B+). Third, it’d be nice to see CM3+ and CM3L+ modules available. I don’t expect those to appear any time soon, though. Indeed, I think the Pi3A+ deserves earlier release. Thank you! I admit that I had assumed the “normal” boot sequencing as given in the documentation would still be in place. My first Pi3B+ will be swapped in in place of a Pi3B connected (and booting from) a Pi3B. From this data, I am assuming that (following an update/upgrade cycle) should Just Work. Congratulations from the PiHome, can’t wait to get my hands on to one of these, Thanks you for hard work. Please, one question. I understand you don’t want to talk about future products but maybe you could say that you are not considering this at all: do you have any plans for a camera board with larger sensor? Say FourThirds larger? That would be very expensive and Pis are all about being INexpensive. Sure but perhaps there could more than one model, like there is Zero and B.
We’re certainly aware of the market for a higher-end camera module. Will the POE hat have fixed headers in place for the POE pins or will it allow stackable headers? I.e. will it be possible to connect an additional transformer to the pins to allow a different voltage say 12v to be used for IR lamps? Ha, ha. A few days ago, I asked Eben how the hardware on RPi’s would evolve in the future!. I even wondered about the possibility of having a Gigabit update for the wired interface!. He kindly answered that, most probably, we would have that… and here it is!!. I didn´t suspect that an actual update on the RPi3 was this close!. Great surprise!!. Please, please, make a faster Pi Zero. Oh, and please also consider a V2 cam with different angle lens options. I’ll second this, but in my own way. I would suggest a camera board with a lens mount. That way, people could obtain their own lenses with whatever specs they want without burdening the RPT with sourcing and providing even a small subset of the rather large range of possibilities. My own preference would be for a C-mount, but CS-mount would be more likely. I am making a digital microscope and bought an M12 mount from http://www.m12lenses.com/Board-Lenses-s/12.htm . The one I bought needed a bit of modification for the Pi Camera, but I now see that they also sell mounts specifically for Pi Camera V1 and V2. I will soon buy those along with more M12 lenses and M12 extenders. It is very nice to use M12 lenses in the Pi Camera! Next to the RUN hole is now a hole labeled PEN. Before, there used to be a ground connector there. How is the PEN connection different? PEN gives you the ability to disable the MaxLinear PMIC, completely powering down the board. More on this in due course. PEN and RUN are signal inputs that are independent of each other. Ground should be used from any of the GND pins on the GPIO connector. That’s a (slight) shame – it means simple solutions like http://raspi.tv/2012/making-a-reset-switch-for-your-rev-2-raspberry-pi won’t work any more. Many HATs totally obscure the GPIO pins. Implementing a reset switch will now require using some sort of shim board to break out a ground pin, soldering onto the GPIO header and hoping that pushing down the HAT doesn’t mess up the solder joint, or buying something like Pimoroni’s onoff shim. It also means that a simple 2-pin female header can’t be used for the switch. I, for one, will miss having that ground hole there. I would have liked to have seen the PEN control added as another hole and the ground hole left alone. Oh well. I still look forward to the other improvements. If I knew this I would’ve waited, I bought the 3B last sunday. Anyway, bright side would be an extra Pi for another project. Nice refinement but too bad it’s still only 1GB DRAM. Only retro gaming use case will see some benefit but not for much else. Only retro gaming? Are you sure? We sell 5M devices a year with 1GB RAM. That seems slightly higher than the retro gaming market. So long as the existing VC4 is in use, no Pi will have more than 1GB. And the VC4 isn’t going to change until a whole new SoC is developed. So…I don’t expect any substantial changes beyond these tweaks before the Pi4B shows up. https://www.microchip.com/wwwproducts/ProductCompare/LAN7515/LAN9514 says the LAN7515 is USB2.0 only. From Eben’s comments in the article, it sounds like it might have been specifically designed for the Pi 3B+ ? Not important but, there appears to be less screen-printing on the 3B+ board than previous boards. Why? It looks nicer, and we found that we didn’t use the component labels ourselves. Ram is to expensive, so rather then requesting more, how about faster/lower power memory instead?, 1Gig of LPDDR4 would both be faster and a way to lower the power footprint, even more so if you could run it at a lower clock rate and only increase the peak bandwidth a little bit. Great news to read. Pi keeps getting better! My current application involving live video analytics can use every last bit of additional CPU performance available, and 1 GB is still OK for now. In the future, will be happy to put any amount of added memory to use with deep learning image-recognition networks. Obligatory nitpick: I notice the POE connector pinout seems to be exactly square. does that mean a flying-lead power connector can be attached 4 rotational positions (3 wrong ways and 1 right way)? Or I guess, intended only for a daughterboard which only fits one way? As you say, the primary goal was to support a daughterboard, where the GPIO connector constrains the orientation. Nice to see! But I agree to the people who want more ram, we definately could need more of it…2gb or even more. Just watch out how browsers – or Mathematica for example – eat up the 1gb for breakfast…more ram for next Pi please. Btw, does the new thermal throttle affect the old Pi 3b, too anyhow above 70 degree? If so, how to disable? Cause I already have a thermal controlled fan on my ‘old’ 3b. We haven’t changed the clocking or voltage rules for any older products. My solution works fine – but ‘kicks in’ at 75 degree, not at 70 already, thats why I asked. But solved as it seems to work as before. Greets, M.
Don’t concern yourself about how Mathematica eats up RAM – not until you have fully understood that the RPi implementation of Mathematica is purely a ‘taster’ version of the full package. I already made that mistake, trying to use Mathematica ‘on the cheap’ to perform a highly-detailed optical analysis of a pro-sumer astronomical telescope. Mathematica, on the Pi, simply is not up to that kind of challenge. It is quite buggy, tends to crash with alarming regularity, and (irrespective of how much RAM you make available to it) it has been released as a version that will not run on anything other than a single-core. Sure, there are workarouds, I started by breaking the overal task into several thousands of much smaller tasks, and then collating all the data at the output of one stage to be used as input data for the next. But, this in itself was a tedious task, and very prone to user-error. A far better choice would have been to run Mathematica on the 12 cores and 128Gb of RAM of my 3.6GHz PC. But, then again, I am a Scotsman, and I wasn’t prepared to pay the asking price for a piece of software that I was only ever going to use once !!! So, before someone else jumps on this tired old ‘RAM’ soapbox, and starts to complain or wish for ‘more RAM and a 64-bit OS’ perhaps they ought to take the time to at least read ALL the comments that have already been made on these issues. You don’t need a 64-bit OS, because you don’t have enough RAM in your RPi in the first place, and you are not going to get any more RAM at the current price bracket. If you absolutely cannot live without more RAM (and the subsequent requirement for a 64-bit OS) then a Rasperry Pi solution is just not for you. No doubt that Mathematica runs much smoother on a ‘high-end’ pc…but it is fine on my Pi, too. Enough to learn how it works and enough to do some cool animations for example. Furthermore it should be the same as the “normal” version and definately using 4 cores, at least here for me. Without a problem. The only problem is the actual 11.2-version which only detects 1 core atm, its a bug (and already reported and being fixed in the next update) – but it could be solved easily by modifying the config file (just have a look at Wolfram-communiy for a how-to). For sure it runs not as smooth and fast as a ‘normal’ pc – but we definately could do more with it with more ram. Same as for the browsers, just watch out how much the new Firefox 57/58/59 eat on a normal pc…if we ever want a normal Firefox again on our Pi, we definately need more ram in my opinion. Just for being ‘forearmed for the future’ at all / going with the time a bit. Sure, 1gb is “enough” – but more is better/offering more possibilities :) Years ago Bill Gates said “8 bit are enough”…but for what exactly? Will the PoE board be open source as a sort of reference implementation of PoE for the Pi? Similar to the CM IO Board. That’s a good thought. We’ll certainly consider it. Yes please be as open as possible on the hardware, connections, and possibilities. As many of us might not be in schools daily, but are still learning by tinkering. Somehow still part of your target group? I have the urge to build a HAT that contains both a POE power receiver and DAC and amp. Thank you for cramming more and more features into the 35 dollar wonder. Check out the datasheets and application notes for the Linear Tech LTC4267 – plenty of useful circuits in the applications section. It would be helpful to know if the ethernet jack has the diodes built-in or not (I’m guessing not because of the four pins – a quick check with a DMM would verify that). Also things like input protection and filtering can be good to know and of course vary between hardware. So a generic reference implementation of some PoE hardware is only partially helpful. I so totally would love a Pi for a price of 80 to 100 Euro. Enough money to deal with a better Soc, 2 to 4 GM Ram, a 2nd HDMI and USB 3.0. With a Pi like this you could replace about 90 % of all PCs in the World (my estimation). At least all PCs of all my older Family-Members. And the most PCs in gouvernments, most of the time big, energy-wasting machines dealing with one self-written, ugly programm. Replace them with an 3 or 3+? No way, not possible, to much isnt running properly. To often “sorry man, this app isnt running, pi to slow or not enough Ram”. No, I dont want to by a Mini-PC, because better Hardware isnt the only important thing. Its the software and the people behind it, what makes the pi different. The 3+ unfortunately is another to tiny step, last great leap was the Pi-2. > To often “sorry man, this app isnt running, pi to slow or not enough Ram”. For general desktop computer use it seems to be enought. I’m using Raspi3 as desktop, it runs Chromium with a lot of tabs open and also a shell with a lot of tabs open. I don’t think every computer really needs more. Working on grafical or video stuff is another ballpark, of course. However, I’m using additional 1.2GB swapspace on a external disc (no ssd), you might wanna lock into that. So, this will probably be the last with the VideoCore IV (except, there’s a B++). 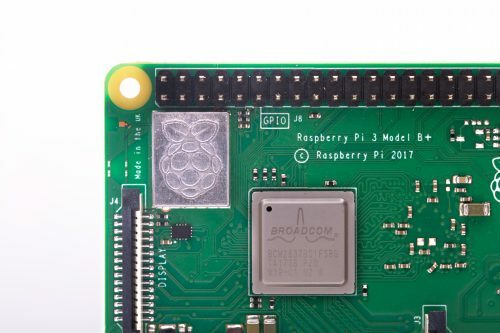 When the Raspberry Pi 4 will be born it will be 2019 or 2020. So, after about 8 years the time has come, that the limitations of the VideoCore IV are finally reached. Yes, it is great, that there is a FOSS driver. It’s the central unit of the Raspberry Pi and very important for the compatibility. But it’s from ~2010 and that’s reeeeaaaaaly old. Probably that will be a break without backward compatiblity. But it has to be done. For the 64 bit. For the 2GB RAM. For HiDPI Screens. For the next 10 years. I wished that pi has a USB signals with pin-head for easily connect to our HAT board!thanks! My very first Raspberry Pi which was ordered on launch day is still working as I type, running my MQTT and Node-RED, embedded in my home security system. Right now I am typing this out on a Pi Model 3 stuck to the back of my TV with Velcro but as old habits die hard, it would have been rude not to order a model 3 B+ from Farnell today. Time to upgrade the back of the TV! I spend a lot of time looking behind TVs these days. Amazing how often you find a Raspberry Pi there. A favourite was walking into the CNN operations room in London and finding several TVs on the wall showing the Raspbian desktop. It’s 2018, we can’t be living in a 512MB world. It’s painfully insufficient to do anything. Minimum 1GB, optionally to 4GB. $35 is great but 55 or even 65 if only for some more RAM please!!! But theirs is a 1.6GHz quad core. 512MB just ain’t enough. Unfortunately, I think this needs to go back to the drawing board for way more RAM. The Pi 3+, like the Pi 3 and the Pi 2 before it, has 1GB of RAM, not the 512MB you are quoting. Come on, make it a success and I am ready to order a few for my robotic club kids. You do realise we’ve sold nearly 20 million Pis over the last 4 years? Do you not think that might already count as a “success” to most people? RPI is like a mac, when sd with raspbian is inserted, it will work. You will get updates (even for firmware). Community will solve you issues. Drivers will work out of the box. With any other board you are basically buying some HARDWARE chips which “maybe” work together. I dont need hardware, i need a working platform. I am personally sick of thiw wanabe computers, which cause only problems, but they run on 74764Ghz. My last experience is with some android box, loaded with the latest and the greatest hardware. It is crashing, manufacturer does not provide any supprt, there are no updates for almost a year, there are some strange crashing errors of certain apps which i have never seen on android, etc., etc., etc. In one word bunch of problems. Hope you get the point, that working solution need much more than just hardware. The rason is that “some” guys using it as a desktop-replacement, for playing games, for browsing and all that other interesting stuff…and not as a controller only. If you really need a simple controller just buy an older Pi 1 or a Pi Zero for example…but a new Raspberry with more ram or the possibility to expand the ram by the user itself just could extend the portfoilo in an awesome way. > Come on, make it a success and I am ready to order a few for my robotic club kids. You might still have a great epiphany before you, or maybe even two: Thanks to scifi tvshows and movies many of us think robots need to have their main computer in their body. But wait, scifi is not reality, they write it so that it is most entertaining. If your robots need more processing power, then make them connect to some bigger computer. This is actually very fascinating, because limits like power consumption for the computing in their bodies will not be so relevant any more. Oh, and they can have some kind of hive mind, like the Borg. Errr – all Pi 2s and 3s have 1GB of RAM. The posting you quote is the launch announcement for a Pi from 2014, i.e. 4 years ago. How do you manage to get to the original B+ (Pi1), when all the info you need is in the blog you are posting too. -There has been a 2B, 3B and now 3B+ in the B range since then, ALL 1GB of RAM, more would be nice but it’s not going to stop the majority of people buying it. If I wanted something more, I’d just buy a second hand laptop. That B+ has ‘shrank’ into the ZeroW replacing the Ethernet with WiFi for a lot less. I see nothing but fiddling with the product because they don’t have a Pi4 to be able to release… No big advantages here at all. No real increase in speeds, because it’s really the same chip with throttling bolted on. Big Fat Hairy Deal!! No increase in memory because the dated video core IV won’t allow it, hence no advantage to using the processor in 64bit mode, hence no 64bit OS. Yet they’re still trumpeting that it has a 64bit processor!! No point except that it’s marketing BS. Along with the usual BS about the US Dollar price, that nobody anywhere can actually buy it for. We need 4Gigs RAM. Hell fire, I mean how much has Ram fallen in price over the last 5 years!…. Ditch the crappy video core IV for something with significantly less restriction. A Processor running at a genuine 1.8 to 2Ghz if you’re sticking to 32Bit. Not this pointless smoke and mirrors trick with throttling.. those would be an actual real improvement. All I can see in this release is marketing hype. Nothing changes here does it…. You are correct, we don’t have the Pi4 for release. That is some time away. This is simply a point release to make the current model a bit better, at no additional cost over the last version. We have a roadmap, and it’s going pretty well. We know what needs to be done over time, but a Pi4 is a long term project, you don’t get much changes out of three years from start to finish, if you are going to do it properly. ie, works well, robust, certified with a solid software base. RAM prices, which clearly you haven’t been following, are going up. As for marketing hype, well, you are entitled to an opinion, wrong though it may be. This is a clear improvement over the previous model in a number of ways – wireless, ethernet, but especially thermal management. And it’s the same price, so clearly you are getting more for your money. Of course, not everyone will be affected by the improvements. And if you’re happy with a competitor product that does all the things you are requesting (is there one? ), then get that until the Pi4 comes out. Hear, hear – I second that. I’m glad I am retired, and I am glad that I never had to deal with ‘programmers’ directly – the vast majority don’t have a clue about efficient coding, not even the fact that good coding eliminates bugs at the outset. I would probably have had to employ an assistant just to hand-write their names on their dismissal letters, just to keep up with how fast I would have been wanting to get rid of them!! Good lord! I blinked and you guys put out the Zero W and now a 3B+, each more impressive than the last! Do you even sleep? So the question is, does the RPi-3B+ provide pins or solder pads for accessing the CEC wire alowing for simpler mod or better yet, is such a CEC power up feature included in the design (accessable via jumper or such? I had the AP2553W6-7 Load Switch IC fail on my RPi-3B some 13 months after purchase. I them replaced it with my old RPi-2 using the official PRI-3 2.5A power plug, however it died about a year later. I know failures happen but is the RPi-3B+ built with a little more robustness as compared to earlier modles or is the RPi family considered a cheap short lived throw away item? They all go through the same testing procedure, there should be no reduction in robustness over the various models. We certainly don’t consider it throwaway, although we do consider it cheap to buy! Does GPU have any improvement for supporting DirectX? Microsoft said the GPU of Raspberry Pi 3 doesn’t have enough capacity for supporting Directx. What for? You might need better software. Maybe also to increase your swap file. -USB3.0, better IO connectivitiy (test: download a large torrent with 10MB/s speed), current situation is as follows: downloading to SD cart freezes the RPI – IO chip just can not handle it, downloading to external drive will give you ~2 or 3 MB/s. Torrent speeds are more or less the same regardless of the RPI version. -sata (NATIVE – or as close as it gets to native! not with some junky usb-to-sata bridge) would be large plus. The Pi is perfectly capable of playing 1080p – I am using it for digital signage, and it works flawless. And, without sounding like Bill, 1G is totally enough for the time beeing – write some decent software! And streaming is no problem, at home I use a Pi for OSMC, and it works perfectly (the problems I face has something to do with the Danish broadcaster, not the Pi). So if you want a PC, buy a PC. We don’t have a model like that I am afraid. Does this iteration of Pi-3B+ introduce any changes to the way the Serial UARTS work? The GPIO uart vs the Bluetooth uart. Hardware vs Software. I was hoping a new SoC and the BT update would give us a second HW Uart so we wouldn’t have to fiddle anymore with CPU clocks, overlays, etc. Pi3B+ does NOT use a new SoC, it’s the same bcm2837. I think the BT part of the wireless chip is the same as well. As I can understand the max speed for the Ethernet is approx 300Mbps. These 300Mbps are shared for the USB bus, so is it possible (if not network load else) to obtain at similar speed at a USB port as USB2 more or less has the same effective speed? Next, is it possible to let the bootloader point to the USB port instead of the SD card, thereby only using a USB2 disk? This could make a perfect mini server. I still awaiting RPi3 with 2GB of RAM at least. I may pay more, but still need it. Because of RAM amount I had to pick competitive SBC and I’m not happy about it until now. Please, please release 2GB revision. Also there is worth to consider another variations of units – 4GB or even 8GB of RAM. By releasing RPi with such huge amount of memory, many complex and resource hungry projects will become possible. Also operation on RAM is better than on the storage because numerous reasons. If software improvements will go by this way then many applications will become even more reliable. Please, please – think about that, do not refuse my words. Google would have found the answer to this, or even just reading the comments here, but to explain it one last time….. The SoC on the Pi3 (and previous models) is limited to 1GB of RAM by the HW itself. To modify the silicon to support more than 1GB is a VERY expensive and time consuming task. It’s also something that would need to be done by Broadcom, the chip supplier, not the RPF. It’s time, in my opinion, that is better spent on the next major model release, the Pi4. I know these aren’t cutting edge questions but ..
1. Any improvement to the analog audio out? 2. Are the media Codecs still a thing? I thought something opened up on the mpeg side of things recently? 1. Not that I am aware of. 2. Yes, patents are not yet free worldwide so we will retain the current system. Per. 1: the sigma-delta noise shaping scheme is now enabled by default in this release of Raspbian. Analogue audio now approaches 16-bit (CD-quality). Is this modification applied also on previous models, by upgrading Raspbian ? It can be useful to drive power mosfets direcly from a Pi 0/0W GPIO’s to make a very cheap FDA with a good audio quality ! Congrats for this new version! Has it been any change on the analog audio output? Does this mean that when I boot the first time that wifi will be enabled automatically if I have my proper wpa_supplicant.conf in the boot folder? or…. Does this mean I will have to be hardwired or connect with monitor and kb for initial wifi setup? How did you previously configure wifi without attaching a keyboard and mouse? The same approach should continue to work (just make sure your wpa_supplicant.conf has country= set). Guys, is R3 or R3+ enough for Libre Office with autocorrect and some pictures? How about pi3b+ model with the mini csi/dsi connectors like on pi zero, would be nice if pi could move towards universal cable compatibility. Congrats on the new pi. I read a lot here about requests for ‘more memory’. As I see it the problem is not the pi3b+ design. It works as conceived: a beautiful learners board that (accidentally?) also happens to be a very decent production machine for maybe 85% of all necessary tasks. The real problem is called ‘bloatware’. Nowadays when code works, it is considered ‘finished’ when it does what the specs say. Is optimizing on size and speed still taught? Or do we leave that to ‘optimizing compilers’ instead of educated programmers? But then, I had 128 machinewords available to write a multi-device bootloader in 1980. To everyone who thinks 1 GB is enough today and you should be better programmer – start Java IDE – half of ram just gone! So all modern IDE developers are bad programmers? The old times were not always the good ones. I like the features of modern IDEs, even if they need a lot of resources. No, of course not. But some are. Otherwise how can you explain that an IDE takes up an entire 1GB of RAM? IDE facilities are great nowadays – I use Eclipse and it’s great – but the resource requirements are absurd. 1GB should be enough for the vast majority of tasks. I grew up with 32k, and you learn to write memory efficient code with that level of constraint. A skill that is sadly missing in many engineers nowadays, simply because they have never had to worry about memory requirements. It interesting to note that a number of the engineers working at Raspberry Pi grew up in an era of very limited memory, which is presumably why we are happy with 1GB – we know how to deal with those constraints. When will the POE Hat be released?! Will there be changes to the cases to accommodate the new Raspberry Pi 3 B+ and the POE Hat?! I would like to purchase all items at the same time. Congratulations Eben, Gordon, Roger, James, Mike and all the other talented crew at Raspberry Pi. It’s been a privilege to be associated with you all this time. Likewise. It’s been a hell of a six years, right? Thank you for all your hard work on Raspberry Pi 3B+! I’m astonished how you continue to evolve (and I really do mean evolve – user feedback (from commercial, industrial and consumer deployment) is your “environment” while efficiency and adaptation power your iterative processes). Congratulations on your latest product. I can’t wait to get my hands on the 3B+! Glad you like the elevator music. Brian (our videographer) is a stone-cold genius. I nearly fell off my chair laughing when I heard it the first time. My Raspberry Pi 3 B+ just shipped! Can’t wait to try it out! Suggestion for future versions: a color-coded GPIO header like on the Tinker Board. It will make setting up projects much easier. My Pi 3B+ turned up today. Definitely a nice speed boost and runs noticeably cooler even without heatsink/fan. Running Minecraft at just over 60 degrees. Will we get a Pi2-Model_B-v1.3 with an BCM2837B0? I don’t need wlan and BT. We’re considering what, if any, derivatives of the 3B+ design to put on the roadmap. Watch this space. Cool. For a $35 device, it is great (how you can fit all the neat features in for the price is just amazing). This new one looks even better. Still swimming in RAM (1G is way overkill). 1+Ghz quad processor Swimming in disk space, as I usually get 16G SD cards. SSH in to test/run apps (C/C++ or Python 3 here). I run RPIs usually headless (glad Raspbian Lite was introduced) . sftp to get/put my programs. Wireless and hardwire Ethernet, USB… Hats galore, interface to Arduinos, etc. when needed. All the amazing Linux tools at your finger tips… Far cry from when I started with Z-80s, 6502s, 680xx, 8086 back when for automation. Yet my company was able to run hydro power plants, substations and such on those ‘old’ cpus. In fact we still use 25Mhz 68332 custom boards for SCADA in some of our substations. So, I just don’t get some of the complaints… There is so much potential here… for $35. Pocket change really. When I need extra umph for something (say cross-compile a custom kernel), or need to use a really fast graphical interface, I have desktop computers for that. Does this RP3+ still have the friction fit SD card slot that the RP3 had, or have you gone back to the push to eject type slot that all the previous Pi’s had? If you buy the official Raspberry Pi case you’ll see that we thought of that! The main problem with the Pi2 push push connector is that it was much more expensive and the lock tended to break which meant you could never get it working again without removing the tiny spring!!! True, but the thing I like about the c4labs and other similar cases is they have a flat top on them. I can easily stack up all my Pi’s either in use or in storage on a shelf. All 4 of my Pis 1A+, 1B+, 2B+ and 3B are all in these cases which nicely stack. When the friction-fit micro SD card slot was first revealed, I remember reading that lots of people accidentally ejected the card from the previous push-push slot when they didn’t mean to by picking up the Pi. Congratulation to Eben and the entire RPi team, this is a great upgrade to the RPi3, I have the new RPi3 Model B+ sitting on my desk already. Same form factor, 3 x Ethernet Speed, 3 x WiFi speed, 1.4GHz processor clock, Network bootable no SD card required when Network booting, Power over Ethernet interface, US$35 price, it does not get any better than this!!! As a company that designed our own custom hardware for many years, I have to say, Fantastic work RPi team! Thank you. As you may gather from the video, this one has been harder to get to the finish line than any previous product. 5GHz wireless in particular is just *hard*. No more “xenon death flash”? ZDF was fixed years ago…. I didn’t know that. I can remember a discussion i had with someone who basically said the RasPi is rubbish. And one major flaw he mentioned was the XDF (or ZDF? typo??). And that was last summer. What version of the RasPi was the first that wasn’t affected by any kind of stronger flashlight? Only the very first batch of Raspberry Pi 2s were affected back in 2015 – Pis which actually demonstrate this behaviour are, funnily enough, a bit of a collectors’ item now. We replaced the affected package with one with an opaque covering immediately…and honestly, if you’ve been convinced by your buddy that a sensitivity to paparazzi is a “major flaw”, I don’t think we’re ever going to be able to bring you around! See https://www.raspberrypi.org/blog/xenon-death-flash-a-free-physics-lesson/ for more. Your friend definitely didn’t have one last summer unless he’d been one of the first people to buy a Raspberry Pi 2 and is still using that. And is regularly firing flash bulbs at it from a distance of less than ten centimetres. He didn’t convince me at all and he is in no way a buddy of mine. It was a forum discussion where he numbered the “many design flaws” of the RasPi and why it is anything but robust. Mostly he embarrassed himself because most “flaws” where in fact user mistakes that could lead to “frying” the RasPi. At one point he claimed that not only flash lights but also sunlight or lasers could cause the RasPi to reboot. And he said that there where several components on the RasPi that could cause these light induced reboots (OpenDIE HDMI? Didn’t really understand what he was talking about. Maybe he just wanted to impress me). I own several RasPis and never was affected by any of the problems he mentioned. Mostly because i mostly double-check what i’m doing before booting up my Pi. I even short-circuited a Zeros GPIOs once. It just didn’t boot up, wasn’t fried and still works without an issue. Sounds like someone making stuff up to sound impressive. Or not, in this case. Good anecdote! I’m one of the “lucky” ones to have a Raspberry Pi 2 that suffers from the Xenon Death Flash. I discovered it when I was taking pictures of my project to upload. Will this make it’s way to the Pi2_v1.2 and the Pi3 too? Why don’t they benefit from this enhancements? Physical limitations (as always)? So, when do we get a Pi2 with the new 2837B0? 500k people have bought Pi3 since January! Will there be a future update that allows connection to enterprise wifi? just wondering as I would like to use my pi in university but the wifi requires account and password and its greyed out when I try to select it? The Pi should be able to connect to most sorts of wireless network already. If yours won’t I suggest asking about it on the forum. With all this effort to improve on the Pi 3, why did they not increase the memory to 2GB? How difficult would that have been? As has been pointed out repeatedly in these comments, the SoC used on the Pi 3 can access a maximum of 1GB of memory. In order to access more memory, a completely new SoC would have been needed. So the answer to your question “how difficult would that have been” is “very”. There is one funny thing though – DDR3 and DDR4 is much cheaper than DDR2. So will it not pay off in some millions of sales instead still ordering DDR2 for all today models? If the POE Hat works with true 48v POE, then this would be a big deal as you could just plug in the pi to any available port with POE. Many organizations use Cisco POE switches just for this purpose. I really really hope that you will soon incorporate a LI battery socket or other connection and the required hardware and software to run from the LI battery and re-charge it when 5V is re-connected and free the Pi from the wall. That’s the One Thing I prefer the (late and lamented) $9 C.H.I.P. for, the ability to run off the grid. One little socket…. come on! I am waiting for my two new Pi 3+’s to arrive, Currently my 3’s lock up when using the Chromium browser with more than a couple of tabs and I am fed up of having to reset them. I appreciate that you do incremental improvements to upgrade performance at the same price, but I can’t help but think the effort would have been better spent in ramping up production of the Pi Zero (& W) and even in upgrading the Zero to 4 core if that’s possible. Most of the projects I do with Pi’s could be done with Zeroes but getting them in units of more than 1 is impossible, and single units still have the huge shipping overhead that makes them not cost effective. One of the reasons the Zero is cheap is because it has an (older) single-core processor. The cost of parts is what chiefly dictates the cost of the Zero, and to keep the cost down, we can’t (at present) afford to put a quad-core processor on it. Development effort doesn’t increase the number of Zeros we can make – that’s down to limitations on how many of them the factory can produce – and it doesn’t enable us to put a quad-core on the Zero. Go buy a Pine, Orange, Banana or whatever and enjoy zero testing, zero quality control and zero support. The Odroid is the only SBC which is anywhere near an alternative and I am sure you will find what you need there..
Hello and a big congratulations to the Raspberry Pi team. Its really good to see such a solid incremental update whilst keeping the cost at $35. This is a long list of improvements that shows you really are paying attention to important details. The quality of the platform, its stabilty and community really makes this a great choice for so many projects. Thanks for your work and dedication over the years. When making ‘realtime’ music changing CPU frequency is something to avoid: It causes lots of so called X-Runs. Now my question: How would P3+ behave when running kernel with governor ‘performance’ (@Pi3 1.2Ghz all the time)? Quite well, I’d imagine. A 3B+ would run at a significantly lower voltage (40-50mV) than a 3B at 1.2GHz. win 10 work with Rpi3B+ ? Are the mounting holes and board dimensions of the 3B+ the same as for the 3B (in other words, can the cases for the 3B also be used for the 3B+)? Can wait to get my hands on the new RPi3B+, as of this writing still not available here in Japan though. One question, can I just swap my RPi3 Stretch mSD image to the RPi3B+ or do I still need to re-install via NOOBS? You’ll need to update the firmware on your RPi 3 image before it will boot on a 3+ – sudo apt-get update / sudo apt-get upgrade should do it. But what does “Improved PXE network and USB mass-storage booting” mean? Is still setup necessary with writing a write once bit? Is there a longer drive ready delay? Is that IMPROVEMENT documented anywhere? I have just got my new pi+ it boots OK from an USB stick (No SD card). The pi seems to be running OK but the act has a constant pattern of off followed by a burst of flashes then off again – not sure if this is a concern. I also notice that only the yellow ethernet led lights up. However, I cannot get it to boot from the network. A few seconds after power up there is the briefest glow from the act led. The Ethernet leds do not light up at all and after about 20 secs the act flashes bursts of four offs. I am able to boot from my network OK with a rpi3. If you’re using NOOBS and it was made prior to March 14, 2018, the brand-new Raspberry Pi 3 Model B+ may not boot from the SD card – even if you fully updated your system with sudo apt-get upgrade or sudo apt-get dist-upgrade. I would be more than happy to use the Raspberry as a NAS at the reasonable speeds. I apologize if this gets posted twice – I can’t see my last message on the thread, but maybe it hasn’t been approved yet? I was just wondering if there was an approximate ETA for the PoE Hat? Days, Weeks, Months… and is the blog the best way to find out about its release? Thanks – really looking forward to getting the 3B+ in my hands and testing my project with PoE. Anyone has measured power consumed by Pi-3+ ?? My quick measurements show an increase of about 25-30%. Can anyone validate or refute this? From what I have heard, we see about a 5% increase in power consumption on a Pi 3B+ compared to a Pi 3B – that is with wifi and Bluetooth turned off on both and no Ethernet connection. The new networking hardware on 3B+ is likely to use more power than the equivalents on the 3B, which is the (largely unavoidable) price paid for the improved performance. Cypress CYW43455 does not use the USB bus, right? Its on the SDIO bus. I think these are good updates to the board,but one that’s been missing since the Raspberry Pi 2 is data over the micro USB port. It would be much more manageable for small builds to only have one cable for power and USB data! For example a PiTop using a Lapdock. It’s a small thing, but could make a world of difference for some people. Ordered a 3B+ and NOOBS from Farnell on the 20th, it won’t arrive until nearly the end of April! What happened to all these thousands of 3B+’s that are supposed to be available? I’m currently working on a stacking HAT and I’m interested in using it in-conjunction with the new PoE HAT. How much power can the new PoE HAT deliver to the Pi? Are we talking type 2/3/4 PoE? Are you going to update compute module too? If the answer is yes, please include also wifi in the module. Waiting to see $35 RPi 3B+ on Amazon. I can see lots of regular RPi 3 for $35, but cheapest RPi 3B+ is $43. Aren’t 90% of RPi bought through Amazon? Any update on the ICASA approval? We are still waiting to buy the RPI 3B+ here in South Africa. Amazing! Can’t wait to get one. Is amazon a good seller or should we just buy from linked retailers?